Even with 12 players PGE Vive Kielce have played on the high level in Veszprem, where home team deserved tight win – 29:27 (14:13). 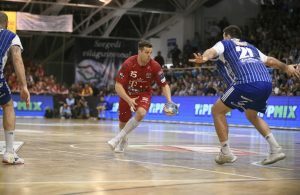 Arpad Sterbik took the title of the Man of the Match at his come-back in Veszprem, while Dragan Gajic scored six goals for the winning team. On the other side, Alex Dujshebaev netted 10 goals. Spaniard was absolutely the biggest danger in team of Talant Dujshebaev. ← Previous Story REVENGE IN MONTPELLIER! RK Vardar win in derby of two last EHF CL winners!